Hi there. Happy October! We are starting the month with The Global Styler series and this time my co-hostesses and I are sharing DIY seasonal wreaths for Fall that are globally influenced. If you missed last month, our theme was pumpkins and my inspiration came from Japanese paper umbrellas. 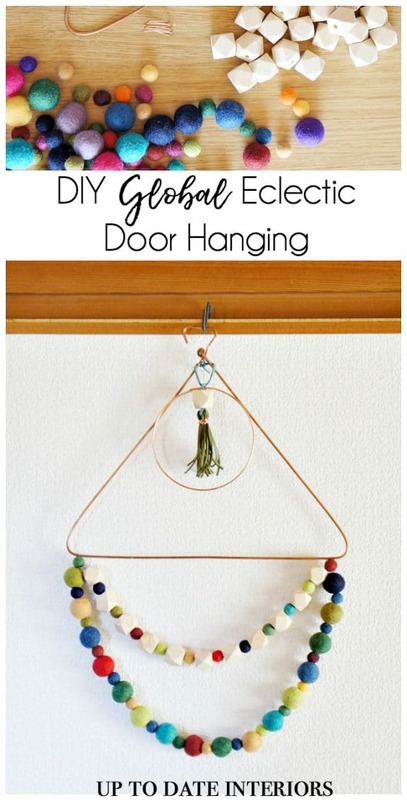 My global eclectic door hanging came about from supplies I had on hand. Did you know wet felting started in Iraq? It has an interesting story and is the oldest technique of felting. I made wet felted balls for this Global Styler DIY but you can also find them easily at craft stores and online. Step one: Bend the copper tube into a triangle. You can use a chair leg or the edge of a table to shape the corners. To prevent scratches, place a towel between the copper and furniture. I measured 12 inches on each side and used the extra 4 inches to create a key hole shape at the top with needle nose pliers. Step two: Use a small copper wire that comes packaged in a coil. Cut off a piece to create a circle and attach with fishing wire. Step three: Create wool and wood bead garland with a thread and needle. Alternate between the two for one garland and use all wool balls for the second for variation. I used small wool balls between the wood beads and large wool balls. Attach the ends by tying the thread around the copper triangle frame. Step four: Create a leather tassel by wrapping leather cording around your hand until you have 10-15 loops. Tie off the top with another piece of cording (or thinner copper wire or thread) and cut the loops at the bottom. You can trim the ends even with scissors. Thread a wood bead over the top and attach to the top of the circle or hang from the hook. I love how creative you can be with door hangings like this. You can use seasonal colors for a Fall wreath and hang feathers instead of a tassel or an ornament for Christmas. Check out the other gorgeous Fall wreaths from my friends. Super cute and always globally inspired!! I love this hanging! I’d have this up all year round! This is absolutely beautiful Kathy! I adore the multiple colors and shapes with the metallic hanger. What a great mix! Another awesome DIY idea!